Sister Brolly was a nurse in France during the First World War. She served with the Queen Alexandra’s Imperial Military Nursing Service Reserve, and was awarded the Victory Medal, Queen Alexandra’s Imperial Military Nursing Service Reserve Medal and the British War Medal. 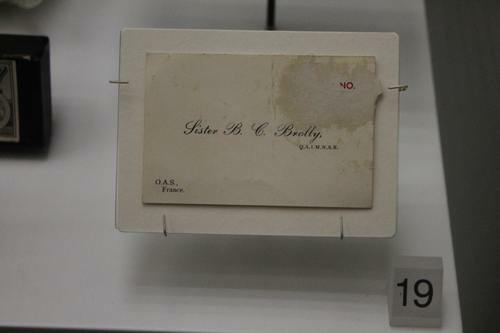 Her business card is on display in the Ulster Museum, Belfast. Photos and main text by Ludovico Carbone moc.liamg|1enobracocivodul#| and Nicoletta Ventrella moc.liamg|attelocin.allertnev#| (August 2017).